The Joint Venture of Saipem S.A. – CTCI Corporation, awarded us a contract of the design verification & construction of the Civil, Structural, Architectural, MEP and interior works for a new 3-storey Administration Building with support building and external works for PTTLNG Receiving Terminal Project. The project consists of an approximate total floor area 84,000 m2 and is located in Rayong province. J-Wan Group Co., Ltd., awarded us a contract of the construction of the Structural, Architectural, and MEP works for a new 5-storey Medical Checkup Building with mezzanine floor and single basement car park. The project consists of a total floor area of approximately 4,800 m2 and is located in Lamphun province. Key Projects Awarded in October 2018. St. Andrews International Schools in Thailand affiliated with Cognita, a global school network of over 60 schools in seven countries, awarded us a contract of the construction of the Structural, Architectural, MEP and External works for new 2-storey Sports Facility with total floor area of 2,500 m2. The project is located at Sukhumvit 107, the foot of the Bearing BTS station, Bangkok province. POC Co., Ltd., a manufacturer and distributor of pet food, awarded us a contract of the construction of the Civil, Structural, Architectural, M&E works for new 3-storey factory with total floor area of 8,000 m2. The project is located in Bang Sao Thong, Samut Prakan province. Key Projects Awarded in August 2018. ThaiNamthip Limited, an authorized bottler of Coca-Cola, Fanta, Sprite, Namthip, Schweppes and Minute Maid for The Coca-Cola Co., awarded us the construction of the Structural, Architectural, M&E and External works for new a warehouse with office, utility building, maintenance building, fuel station, scrap yard with an approximate total floor area of 2,475 m2. The project is located in Bang Lamung, Chon Buri. Inteqc Feed Co., Ltd., a manufacturer and distributor of fish and shrimp food, awarded us a contract of the construction of the Structural, Architectural, M&E and External works for 2 new swine farms, office building, car park, canteen, relevant facilities and utilities with total floor area of 58,000 m2. The project is located in Kanchanaburi province. CP All PCL, a subsidiary of Charoen Pokphand Group (CP Group), the sole operator of 7-Eleven convenience stores in Thailand, has awarded us the construction of the Structural, Architectural and External works for new 13-storey parking building and 4-level basements with an approximate total floor area of 27,000 m2. The project is located in Pak Kret, Nonthaburi province. Kow Yoo Hah Isuzu Sales Co., Ltd., Authorized Isuzu car dealers, awarded us the construction of the Structural, Architectural, MEP and External works for their new 2-storey building, office, auto repair service area and wash & decorate car area with an approximate total floor area of 14,800 m2. The project is located in Lamlukka, Patumthani province. Department of Airports (Thailand), officially awarded Christiani & Nielsen (Thai) Public Company Limited a contract of the construction of the Structural, Architectural, M&E and External works of new Passenger Terminal Building and Parking Building with skywalk. Also included are the renovation works of the existing building in Khon Kaen Airport with total floor area 66,900 m2. After completion this airport will facilitate 2,000 passengers per hour or 5 million people annually supported by parking lot 1,160 cars. Department of Airports (Thailand), officially awarded Christiani & Nielsen (Thai) Public Company Limited a contract of the construction of the Structural, Architectural, M&E and External works of Passenger Terminal Building 3 and Parking Building. Also included are the renovation works of the existing Passenger Terminal Building 1 & 2 in Krabi Airport with total floor area 82,750 m2. 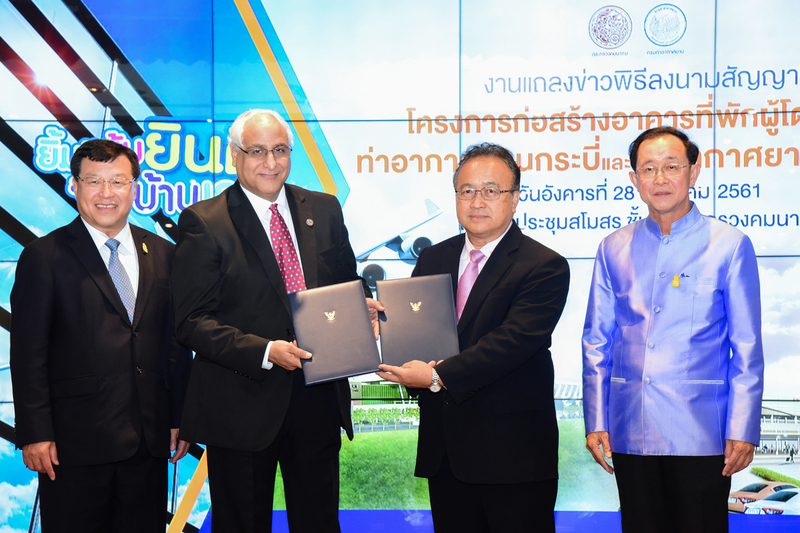 The Contract Signing Ceremony for the Khon Kaen Airport and Krabi Airport between Department of Airports (Thailand) and Christiani & Nielsen (Thai) Public Company Limited (CNT) on August 28, 2018. Key Projects Awarded in July 2018. CPRAM Company Limited, a subsidiary of Charoen Pokphand Group (CP Group), awarded us the construction of the Structural, Architectural and MEP works for the existing chilled warehouse with an approximate total floor area of 1,200 m2. The project is located in Lat Krabang Industrial Estate, Bangkok. Alliance Laundry (Thailand) Co., Ltd., is the world’s leading designer, manufacturer and marketer of commercial laundry equipment, providing a full line of commercial washing machines and dryers with load capacities from 15 to 400 pounds, as well as presses, ironers and laundry finishing equipment, awarded Christiani & Nielsen (Thai) Public Company Limited a contract of the construction of the Structural, Architectural, MEP and External works for the new manufacturing and relevant facilities with an approximate total floor area of 30,000 m2. The project is located in Hemaraj Eastern Seaboard Industrial Estate, Chonburi province. Key Projects Awarded in June 2018. King Chulalongkorn Memorial Hospital, one of Thailand’s leading medical school affiliates widely considered one of the best and largest public hospitals in Thailand, awarded Christiani & Nielsen (Thai) Public Company Limited the construction of the Structural, Architectural and MEP works for 26-storey dormitory building including refurbishment of the 5th and 7th floor at Navamintra-Chini Building and 7th floor at Kakka-nang Building with an approximate total floor area of 34,743 m2. The project is located on Rama IV Road, Bangkok. BayWa r.e. (Thailand) Co., Ltd., has been awarded the turnkey EPC works of a photovoltaic power generation facility with the capacity of 999.7 kWp at Tetra Pak Rayong located in Eastern Seaboard Industrial Estate, Pluak Daeng, Rayong province. They have engaged Christiani & Nielsen to engage in the full engineering and execution of the project. Union Galvanizer Co., Ltd., an anti-corrosion service company, specialize in Hot Dip Galvanizing — from light commercial industry through to large-scale projects, has awarded us a contract for the construction of the Structural, Architectural, MEP and External works of a new 3-level hot dip galvanizing plant with 2-storey office comprising approximately 6,280 m2 of total floor area. 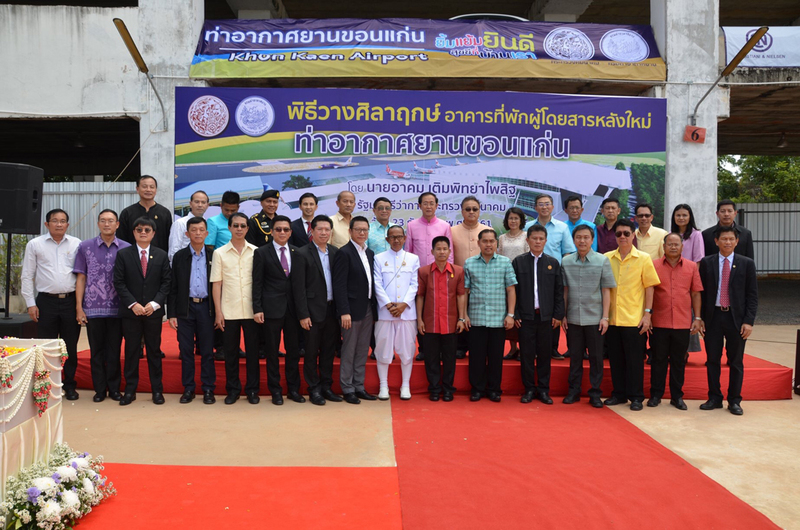 The project is located in Chachoengsao province. Wongkusala Estate Co., Ltd., the owner and developer of Bambini Villa, a unique community mall serving the high-end residential community of locals, Japanese and other expats in Sukhhumvit Soi 26, has awarded Christiani & Nielsen (Thai) Public Company Limited the project’s construction including the Structural, Architectural, MEP and External works for the new 2-storey Community Mall with a total floor area of 4,900 m2. Located in the heart of Bangkok. Key Projects Awarded in May 2018. SIAM GLASS AYUTTHAYA COMPANY LIMITED, a subsidiary of Osotspa Public Company Limited, awarded Christiani & Nielsen (Thai) Public Company Limited the construction of the Structural, Architectural and External works for the Extension of their glass bottle factory consisting of an approximate total floor area of 10,300 m2. The project is located in Ayutthaya province. Key Projects Awarded in April 2018. Property Perfect, one of Thailand’s principal quality real estate developers offering properties in prime locations in Bangkok, surrounding provinces and top tourist destinations for the past 32 years, has awarded Christiani & Nielsen (Thai) Public Company Limited the construction of the Civil, Structural, Architectural, M&E and External works for 142 Townhome units. The project is located in Bang Yai, Nonthaburi province. Key Projects Awarded in March 2018. McKey Food Services (Thailand) Ltd., a leading processor and supplier of poultry products for leading QSR (Quick Service Restaurant) customers and the food service industry, awarded Christiani & Nielsen (Thai) Public Company Limited the construction of the Structural, Architectural and M&E works for a single storey dry storage for facilitating new plant requirements with an approximate total floor area of 528 m2. The project is located in Bang Sao Thong, Samut Prakan province. Tipco Tower Co., Ltd., a subsidiary of Tipco Foods Public Company Limited whose business operations includes producing and exporting canned pineapple, pineapple juice concentrate, canned mixed fruits and beverages, awarded Christiani & Nielsen (Thai) Public Company Limited the contract the construction of a new 20-storey office building. The scope of work comprises of the Structural, Architectural, underground water tank, road pavements, external drainage, fence and hardscape works with a total floor area 28,800 m2. The project is located on Rama 6 Road, Bangkok. Siam Kraft Industry Co., Ltd., the Packaging Paper Business Unit of SCG, is the first manufacturer of high-quality packaging paper in Thailand and the biggest manufacturer in Southeast Asia. They awarded a new contract for the Civil, Structural, Architectural and M&E Works for their Anaerobic Effluent Treatment Plant No.5 that includes a total floor area of 7,687 m2. The project is located in Ban Pong, Ratchaburi province.